Deep beneath the frozen ice cap at Mars's southern pole, scientists have discovered a lake of liquid water, raising the prospect that there are more subterranean lakes to be found below the surface. For the first time, scientists have been able to confirm that liquid water exists on Mars. Water is known to survive as ice on the red planet's surface and small amounts of water vapour have previously been detected, but the thin atmosphere prevents liquid water from forming on the surface. But now researchers have found a lake of liquid water 1.5 kilometres below the ice of Mars's southern ice cap. This latest study, published in Science, uses data collected by the Mars Advanced Radar for Subsurface and Ionospheric Sounding (MARSIS), a piece of equipment on the European Space Agency's Mars Express orbiter. Launched in 2003, MARSIS has been beaming down radio waves onto Mars, then recording their reflections from the surface. It has been able to not only map the exterior of the planet, but also peer under the top layers of rock. After a few years the team based at the Italian National Institute for Astrophysics in Bologna noticed small, bright echoes being reflected back from under the planet's southern ice cap. Unsure what this might be, the researchers spent further years watching for these blips as the spacecraft passed over the south pole. Eventually, all the evidence suggested that this was not just underlying rock or subsurface ice, but was in fact a subglacial lake of liquid water. The researchers can tell that the potential body of water is roughly 20 kilometres across, but are unable to say just how deep it might be. They know it must be at least a metre deep, otherwise the radar used to detect it would have simply passed straight through. 'We are not currently able to accurately estimate where the bottom of the lake or the base of the aquifer is located, but we can certainly say that it is at least a few meters in the order,' says Pettinelli. This is not the first time that liquid water on Mars has been hinted at. Previous images from orbiting satellites and samples taken by rovers have shown what appear to be ravines cutting through the surface. But is it thought that these may have been created by intermittent meltwater from the glaciers. The most significant revelation in this latest discovery is the permanence of the lake. For life to exist and then to survive, it needs a stable environment, unlikely to be provided by the seasonal flow of water on the planet's surface. So the presence of a larger and persistent body of water could change this. This study could not determine whether there is (or has been) life living in this lake. What it does uncover is a useful starting point for any further missions. Could anything be living in the lake? The conditions in the lake are expected to be extreme. To stay liquid beneath more than a kilometre of ice, it is likely that the water is hypersaline (very salty). Usually this would make it difficult for life to exist - but it's not beyond the realms of possibility. Researchers looking at how life survives in extreme environments on Earth, such as the frozen poles, could help us understand how life might survive on Mars. In Antarctica, researchers have found subglacial lakes trapped beneath up to 800 metres of ice, isolated from the surface for tens of millions of years. Even there, the water is teeming with bacteria and archaea. Dr David Williams, a Researcher of Diatoms at the Museum, says 'Yes, technically tiny life forms such as diatoms and cyanobacteria could survive in these environments. But that is not the question we should be asking. 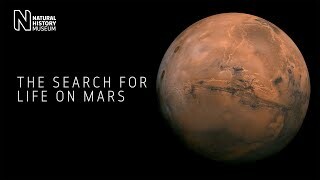 Discover more about the search for life on Mars.